Republicans are one step closer to fulfilling their years-long pledge to repeal and replace Obamacare. The Senate unveiled its legislation to dismantle the health reform law on Thursday. While it's likely to change before lawmakers vote on it -- possibly late next week -- it's already clear who will benefit and who will lose under the Senate plan. Though senators promised to write their own repeal bill, their proposals largely mirror the House legislation. Both would radically overhaul Medicaid, effectively ending Medicaid expansion and greatly reducing federal support for the overall program. Both would get rid of the individual and employer mandates, as well as eliminate taxes on the wealthy, insurers and others. But the Senate bill also differs in significant ways. It would provide subsidies based on income, cost of coverage and age, jettisoning the House plan to base assistance mainly on age. It would maintain Obamacare's ban on allowing insurers to charge higher premiums to those with pre-existing conditions. And it would shore up the individual market for the next two years by allocating money for Obamacare cost-sharing subsidies and by creating a fund to help insurers cover high-cost enrollees. Senate Majority Leader Mitch McConnell said the legislation would make health insurance more affordable, strengthen Medicaid and stabilize the insurance market. But a wide array of critics slam the bill, saying it would send premiums and deductibles skyrocketing for many, eviscerate Medicaid and leave millions uninsured. The nonpartisan Congressional Budget Office is expected to issue its analysis of the bill early next week. Until then, CNNMoney lays out how the plan would affect Americans. Younger Americans could pay less for coverage. Like its counterpart in the House, the Senate plan would lower premiums for younger Americans by allowing insurers to charge older enrollees more. Policyholders age 20 to 29 would save between $700 and $4,000 a year, on average, according to a study by the Milliman actuarial firm on behalf of the AARP Public Policy Institute. Would the Senate bill to repeal Obamacare help you or hurt you? Tell us about it at healthcarestories@cnn.com and you could be featured in an upcoming story. Also, unlike Obamacare, the Senate bill would provide more generous subsidies to enrollees in their 20s and 30s who qualify for aid. They would pay no more than 6.4% and 8.9% of their household income, respectively, towards premiums. That compares to 16.2% for an enrollee in his early 60s. The healthy could buy less expensive plans that cover fewer services. Obamacare requires insurers to offer plans with comprehensive coverage that pick up a certain share of the average costs. But those mandates also made policies more costly, prompting complaints from those who don't want such a rich benefits package. The Senate bill would allow states to opt out of those provisions, which would permit insurers to sell slimmer, but less expensive plans. That would likely be fine for healthy consumers who don't go to the doctor much. The wealthy would pay less in taxes. Just as in the House bill, the Senate legislation would eliminate two taxes that Obamacare levied on the wealthy to help pay for the law. Under the Affordable Care Act, single taxpayers with incomes above $200,000 and couples making more than $250,000 annually have to pay an additional 0.9% Medicare payroll tax on the amount they earn above these thresholds. These taxpayers may also be hit with a tax surcharge of 3.8% on investment income above those thresholds. These levies would disappear in 2023 and 2017, respectively. 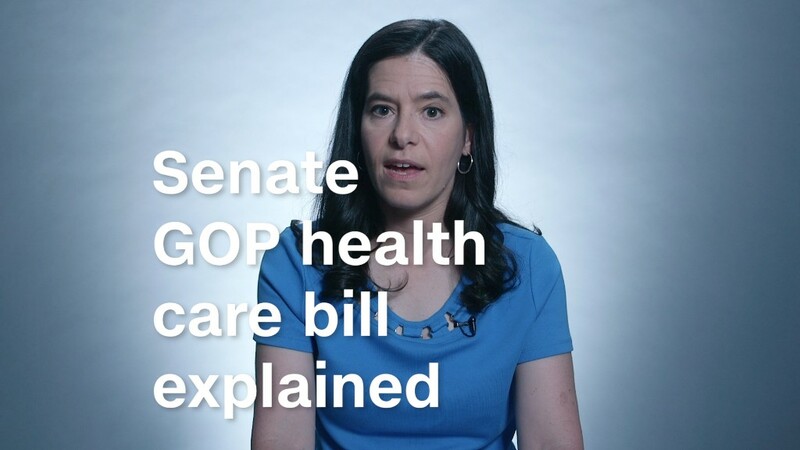 And the bill would allow folks to contribute more to Health Savings Accounts, which are primarily used by Americans who are better off and can afford to sock money away for health care expenses. Insurers would receive more federal funds. Aiming to stabilize the individual market in the near term, the Senate would allocate funds for the cost sharing subsidies until 2019. These payments reduce the deductibles and co-pays for more than half of policyholders on the Obamacare exchanges. Insurers have been pressuring President Trump and congressional Republicans to guarantee the funding of the subsidies for months. The uncertainty surrounding the payments is prompting some carriers to hike rates for 2018 or drop out of the exchanges. The bill also provides $50 billion over four years, starting in 2018, to help stabilize the insurance market. This reinsurance fund would give federal injections to insurers to help them cover higher-cost enrollees. Many Obamacare enrollees will pay more out-of-pocket for health care services. There are several measures in the Senate bill that would increase deductibles and co-pays for many Obamacare policyholders. The primary one ties the premiums subsidies to the cost of bronze plans instead of silver ones, upon which Obamacare payments are based. In 2017, the average deductible for a silver plan is just under $3,600, according to Health Pocket, an insurance shopping site. But bronze plans have an average deductible of nearly $6,100. This means consumers will likely have to pay more out of pocket to see the doctor and get treatment. Also, insurers will be able to cover less of the cost of care and offer skimpier policies in states that waive certain Obamacare insurance regulations. They would also be able to sell plans with very high deductibles if states opt out of the Obamacare provision that caps consumers' out-of-pocket costs. In 2017, policyholders only have to pay up to $7,150 a year for services covered under the essential health benefits provision. The Senate bill does provide $62 billion in state grants to lower premiums and out-of-pocket costs for Obamacare enrollees, particularly those who are sick. But experts say the money wouldn't go very far. Lower-income Americans could be left uninsured. About 11 million Americans gained coverage under Obamacare's Medicaid expansion provision. The Senate bill would eliminate the enhanced federal funding for the program by 2024. While that extends Medicaid expansion's life for a few years longer than the House bill, the end result is the same: Low-income adults would likely be kicked off the rolls. Lawmakers would also limit federal support for the overall Medicaid program, which covers more than 70 million low-income children, parents, elderly and disabled Americans. States don't have the resources to make up the difference, so they would likely reduce eligibility, curtail benefits or cut provider payments. All this would likely leave poor Americans either without coverage or with plans that cover fewer services. It may also make it harder to see a doctor since fewer physicians may be willing to take a pay cut to see Medicaid patients. Senators would also eliminate the cost-sharing subsidies -- which reduce deductibles and co-pays for lower-income Obamacare enrollees -- in 2020. More than half of those who buy policies on the exchanges qualify for this assistance, which can shrink their deductibles to as little as a few hundred dollars a year. Older enrollees would see premiums soar. Americans in their 50s and early 60s benefited from Obamacare because insurers could only charge them three times more than younger policyholders. The bill would widen that band to five-to-one. What's more, the Senate bill would provide less generous subsidies to older folks who are eligible for assistance. Those in their early 60s would have to pay up to 16.2% of their income towards coverage, compared to a maximum of 6.4% for 20-somethings. Fewer middle class Americans would qualify for subsidies. The Senate bill would tighten the eligibility criteria for premium subsidies starting in 2020, shutting out more middle class folks from government help. Only those earning up to 350% of the poverty level ($41,600 in 2017) would qualify, rather than the 400% threshold ($47,500 in 2017) contained in Obamacare. Those with pre-existing conditions or opioid addictions may receive fewer covered services. Under Obamacare, insurers must provide 10 essential health benefits, including maternity, mental health, substance abuse and prescription drugs. The Senate bill would allow states to seek waivers of this provision, opening the door for insurers to offer less comprehensive policies. This means those with pre-existing conditions may not be able to buy plans that cover all of their treatments and care.